We are proud to roll out our latest website redesign project from one of our favorite customers, Catering To You. We’ve been working with Catering To You for well over a decade and we just love working with these wonderful people. 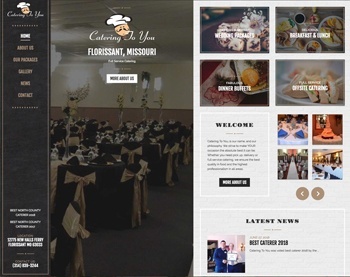 Their beautiful banquet facility is located in Florissant, Missouri and they provide full service off site catering as well. I’ve been to many events that they have catered and I can promise you that their food is DELICIOUS. This is the third website we’ve created for them over the years and of course it’s the best one yet. We selected a rich coffee colored cafe theme with sidebar navigation layout for this site. Besides the unique layout, this site also includes some nifty mouseover effects so check it out!